I will retire from the Voice of America on June 23, after 32 years as audience research analyst and broadcaster. I was hoping to continue to produce VOA Radiogram as a contractor. I approached various BBG and VOA offices. They all declined. This entry was posted in Digital Modes, News, Shortwave Radio and tagged Kim Elliott, VOA Radiogram on May 27, 2017 by Thomas. If they want to send digital info. via short wave, then why don’t they simply utilize the data capacity of DRM in the first place? (after all DRM is quite efficient at that .) Another attempt to re-invent the wheel? Don’t believe the hype from DRM consortium and receiver manufacturers. The last years have taught me to exercise a strict “I believe it when I see it” policy. 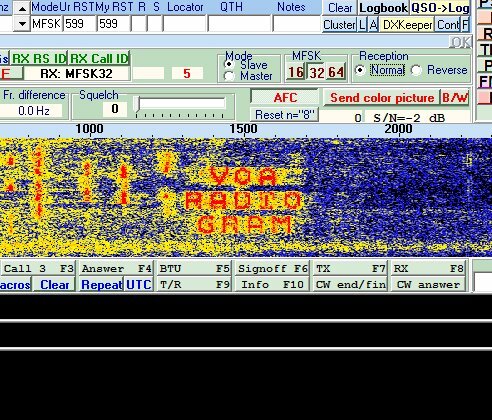 Modes used by Radiogram are far more robust than DRM(I have received both so I know where I am coming from) and software easily exists to decode them since ham radio operators use them too. Also, Radiogram is essentially data over AM – you can use an AM receiver to hear the tones, and decode them with software either via an audio patch or acoustic coupling. Not the case with DRM which entirely needs either a special receiver or an SDR or an access to radio’s IF. IIRC there were a few EasyPal(version of DRM adapted for ham radio) tests a few years ago but they weren’t as successful. I love DRM as technology but the hype around it is too much. The concept is a good, cheap alternative to the much superior DRM standard. Personally, I don’t mind its continuance alongside DRM. The radiogram initiative needs a better codec (research should continue) and dedicated hardware or hardware similar to the Titus 2. Flexibility in connecting a display, e.g. HDMI, is essential for these digital initiatives. I’d love to hear and read digital information via shortwave on my home theater with its projected display. I commend the originator of this concept for his willingness to continue the project.